I used to be a huge planner. I often had words, Scripture verses and goals set out for my year, or a specific season of life. And I owned those plans like a boss. But several years ago, there came a point where I stopped making plans and went into survival mode. The dreaded C word had become part of my life. What started out as a normal doctor’s visit quickly turned into pure crazy. Several specialists, biopsies and a series of intense weeks later, I was in an OR room being prepped for surgery. Cancer came into my life so quickly that I barely had time to breathe, let alone process what was going on. I was extremely blessed! My thyroid cancer was 100% contained in the mass removed, my margins were clear and the doctors didn’t feel I needed the chemo and radiation that often comes after surgery. What a relief. However, one of my vocal chords was severed during my surgery and the others were traumatized, so the following months I communicated by dry erase board and silent prayers as I healed. But I was alive to live another day for Jesus! That’s what my heart kept focusing on, no matter how hard it was to live in silence. I’m now five years cancer free, praise the Lord! I still have the visible scars to prove it. Plus my vocal chords have recovered and I can sing again. That’s something I never thought I’d be able to do again. Has your life ever been turned upside down? We often have the full 12 months of a calendar year scheduled out, down to the minute-by-minute itinerary of our summer vacation. 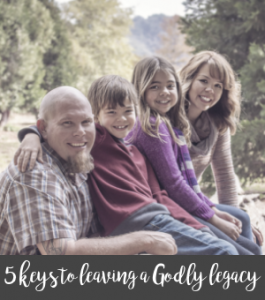 We can even develop five year plans for our family, business or ministry. But circumstances still come along that throw the best laid plans right out the window. Life is so much more than our disappointments. Life is filled with disappointments, that’s why I am so glad we have Jesus. 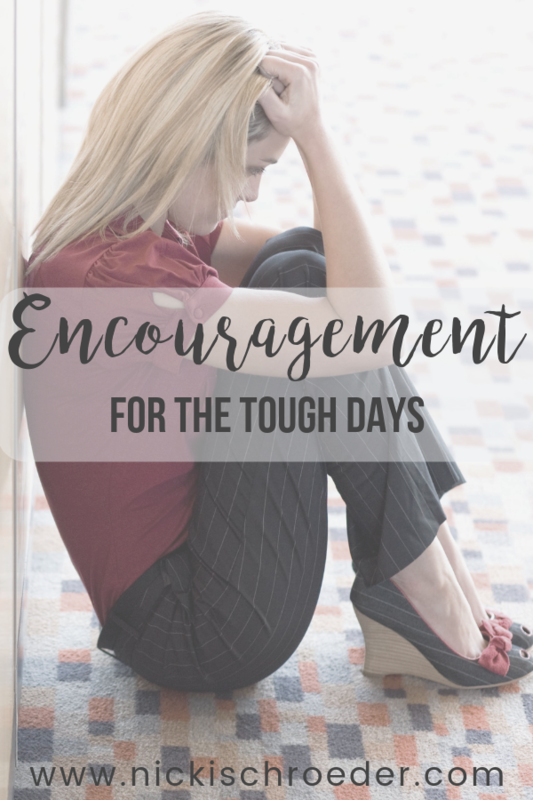 We can learn to cling to hope in our tough spots. That hope allows our faith to grow deeper roots. And with those deeper roots comes a peace and a joy that surpasses all understanding. The above Scripture verses helped me get through some of the hardest parts of my life, including the cancer. And when sucky things happen, I cling to the truth that God works all our crazy stuff out in a way that ultimately gives Him the glory, if we lean on Him. 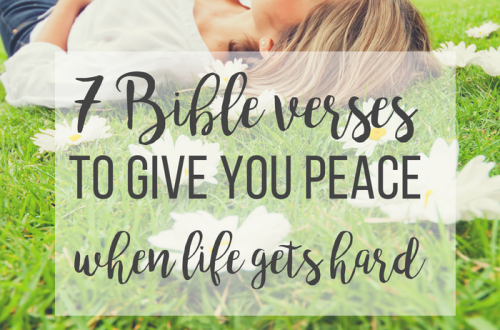 I believe we can find hope and peace and a sense of joy in the middle of our darkest days, when we lean on Him. I’m glad I don’t have to understand why all the crazy stuff happens, I just need to trust in the One who does and lean on Him. We all face bumps in the road of life. Maybe your “bump” right now is divorce, or the loss of a child. Or maybe you or someone you love is facing cancer or another unforeseen health crisis. Are you just fed up with life? Or maybe your kiddos or spouse are falling short of your expectations. Maybe you’re dealing with infidelity or another betrayal. Or maybe you wish you made different choices in life. The good news is that we are never alone in our struggles. Even though we are not in control, we can place our trust and our hope in the God who is. The Lord will never leave us or forsake us, no matter how hard life gets. Sometimes it takes all our strength just to make it through those tough days, but we never have to do it alone. Face the good days, the bad days and the in-between days with Jesus. Endless opportunities await us each day to be the light in a dark, fallen world, even during our own seasons of disappointment. 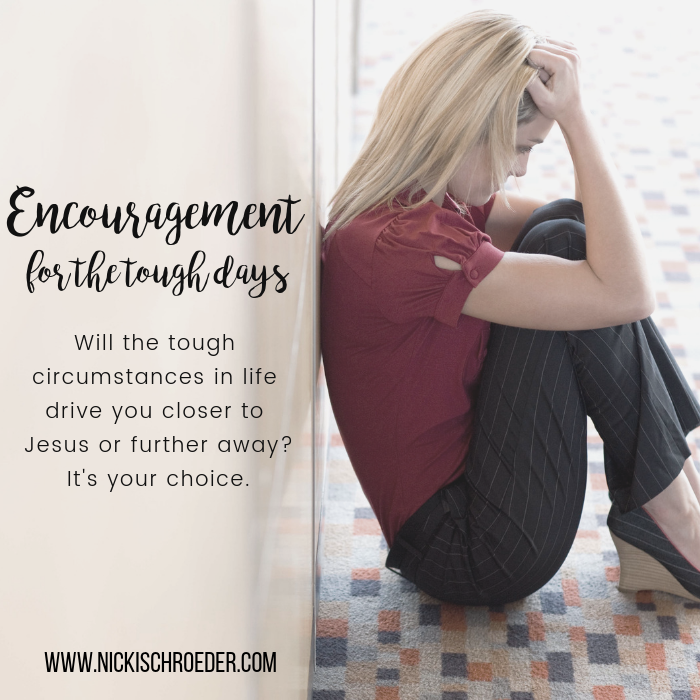 Will the tough circumstances in your life drive you closer to Jesus, or further away from Him? It’s ultimately your choice. I really needed James 1: 2-4 today. It prompted me to pray for steadfastness (such a great word!). Thank you for sharing your powerful story with us! 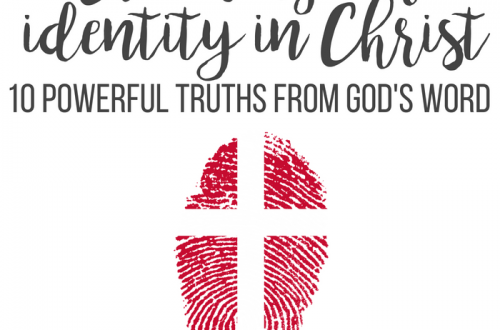 What a great question – will the tough times push us toward Christ or away from Him? Oh, I pray, that I won’t waste my trials but press in closer than ever to Him. I love this solid encouragement here today, Nicki! And yes, I agree with Melanie above. I liked your question. Ultimately we get to choose whether the hard things of this life draw us closer or farther from Jesus. I want to draw closer to Him in my trials! It’s the only way to get through! Oh, I’m so grateful you’re well, Nicki … and that you have a story to share that will encourage others to look to God in the dark times. When we meet Him there, we’re never the same. The valley of the shadow ends up being our place of deliverance. 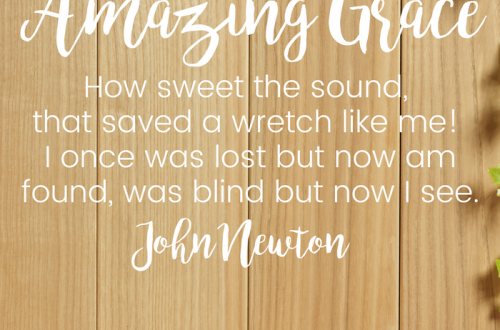 I’m so grateful He redeems our sorrows and our griefs. Yay for being cancer free! I am thankful that we can depend on God all the time. When I’ve been through struggles God has been so faithful to be with me. Reading scriptures like those you shared are always helpful. I’ve also found the Psalms to be so comforting. Blessings to you! Thanks for sharing your story, Nicki! Praise the Lord for His healing in your body and life! In a season of serious illness, God used a speech by Joni Eareckson Tada called “Deeper Healing” to minister to me. 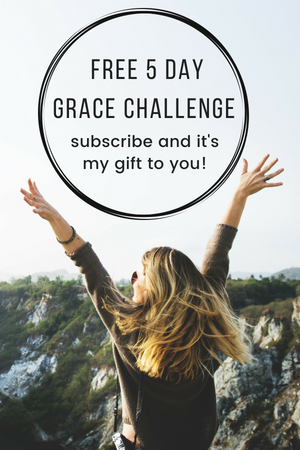 I realized that I was being given a gift in my suffering. 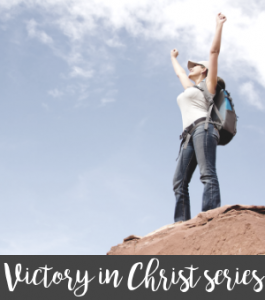 It was a painful and long journey, but I’m so glad I went through it – so glad GOD brought me through it. My life is richer because of it. But without His Word, there’s no way I would have survived it. He is faithful!